Design Villa overlooking the postcard bay of Amalfi, Conca and Ravello, town at 5 m.
La Calcara, an arquitectural prize winning design Villa, sits in the middle of a 7.5 acres private estate that runs from the Amalfitan road all the way to the sea . It is surrounded by lemon, orange and olive orchards, that toghether with bouganvilleas in a typical gently terraced landscape they create the classic postcard Mediterranean atmosphere. Its large infinity sea water pool wiith its 18mx8m in size creates the feeling of being suspended upon the Mediterranean sea. Guarenteeing water temperature always in excess of 75 degrees F, the pool is HEATED in the months of March, April, May, September and October. The pool water, being directly pumped from the sea, is treated with the ozonator system that eliminates chlorine and preserves the natural flavour of the mediterranean sea below. The result is having the sea below the Villa, delivered up to the house pool area, all for a stunning swimming experience . The property is entirely exposed to the south, located on the coastal stretch from CapoDorso to Maiori, facing directly Amalfi, Ravello and Conca De Marini. The sun rises to the east over a 12th century neighbouring Norman Tower, crosses the Med over the south , and sets over the bay of Amalfi to the west, with the result of illuminating all premises from sunrise to dusk. Nearest sea, our own at the property sea bay. Nearest sandy beach is Cavallo Morto, at 500m, by water taxi. Nearest restaurants in Maiori at 5 minute car drive. Amalfi at 20m car drive, Ravello 25 minutes drive, Pomepei at 30 minutes ride. Stepping into the house you will find the main sitting room from where you acces the fully equipped modern kitchen and to a panoramic terrace overlooking an authentic Norman tower, the mediterranean sea and a lush forest with an encrusted 11th century Byzantyne monastery in the background. From the living room you also access 4 of the total 6 BEDROOMS , the shaded and furnished east terrace, and to the swimming pool path out on the west side. TWO (2) ADDITIONAL DETACHED BEDROOMS form part of the Villa : one with a queen size double bed with en-suite bathroom, which is part of the main house and has an indipendent access, and one with two single beds and separate bathroom two meters away from the main house. The Villa features air-conditioning in the main living room and in each bedroom but the smallest one, which is well shaded and served by a ventilator. From the house through a private path you have exclusive land access to the sea, where you can dive into the water through a sun bathing platform or one of the two natural grottos. To finish up the natural sorrounding there is a waterfall, with its sparkling mountain water cascading into the turquoise sea. The villa is reached from the main coastal road, by accessing via the property main gate. Just in front of the gate there is the SITA bus stop. After crossing the the property gate you would drive aprox 200 yards through the estate on a private road to reach the Villa's 5 car parking area. From there, it is just a 20 yard plain surface walk to the house entrance, no steps involved. . The pool area is at 30yards from the main house, and there are 15 steps to walk down or up to or from it. At Villa la Calcara we offer cooking on demand solutions based on four menus. We give tips on favourite restaurant locations, boat rentals and provide free of hassle boat charter services. 2019 prices take into considerations heated pool in the middle season months plus further Villa outside spaces and interior decoration improvements yet to be in the photo album. I live in portugal with my family: my wife who is a designer, my two girls, viorica and the pets. I love the ocean ...but as I married an italian muse, we agreed to keep a foot in the med, this house is definetly my favourite mediterranean sea hydeaway. for those that tend to enjoy a property...the amazing seawater swiming pool (heated in March, April, May, September, October, November), once a day we go down to the turquoise sea and its natural grottos...350 steps it is a fantastic excercise! and tipically twice a week we ask Carmela (the house keeper!) to cook for us...as she knows the art as anybody good in town! The sitting room includes a dining area and a lounge area completely decorated with a mix of ethnic and contemporary furniture. You will find a TV (cable TV), a video, a stereo, etc. The kitchen is modern and fully equipped: cooker, hob, fridge, freezer, washing machine, microwave etc. TV content via satellite dish, with worldwide channels, SKY and Sky sports. All major languages. you can rent them in Amalfi, and have them delivered at home. From June to October CHANGE OVER DAY IS SATURDAY: Check-ins and check outs are performed JUST on SATURDAYS. Min stay one week, or any weekly multiple. Please read the information in the PRICING section on this Villa. Outside: The swimming pool is a 18m by 7m. It has an infinity point and boasts salty water.Open from march till november. Heated in the months of March, April, May, October and November. In december, january and february the pool is empty. Cleaning / Towels / Linen / Maid service: The house is provided with linens and towels, changed every Saturday. three times a week cleaning is included. Local cook upon request. The villa was so beautiful and more expansive than the photos show. The place was perfectly clean and set up well to host groups. The views were incredible from every aspect of the house! Ulrico was very responsive and helpful during the planning process, and Carmela (the house manager) was the kindest and most accomodating woman. The only upsetting factor was that we were unable to use the pool during our stay. I checked a few times prior to arrival that the pool would be heated and useable for our dates, but learned once there that the pool only heats to a max of 22 degrees Celsius. Since this was a big selling point for us, not being able to comfortably use the pool was disappointing. The pool heating system works by a device called heat pump. It is a device that interchanges the difference between sun heat with the air temperature, and transimts that to the water. In general that difference is around 6 degrees celcius. At the time of Barbara's stay, in early March, winter season by all effectes, the day air temperature was 14 degrees, with cloudy weather. Still, the heat pump managed to add 8 degrees celcius and take the water's temperature up to 22 degrees. Today on March 29th, about 20 days later the outside air temperatures are 18 celcius, and will be on average around 20 degrees celcius by the middle of April, on a very conservative estimate.. Therefore we are confident that the pool water temeperature will be in excess of 24 degrees from now on, based on a conservative estimate of adding 6 degrees to the outside temperature. To make things very clear our heating system is designed to create summer water temperatures in spring and autumn, via adding 6 to 7 degrees to the pool temperature compared to average air temperature. That means addressing the months of March after the third week, April May, September and October. by adding 6 degrees celcius, we can rest assured to enjoy water temperatures of minimum 24 degrees starting late March, and in excess of 27 degrees stariting late April all the way to the end of October. The pool heating system at villa la Calcara is designed to improve the middle season, it is not a gas heater like those found in winter ski resorts, that heat pools at 35 degrees in freezing temperatures. We are sorry for Barbara's dissapointment, but she came too early in the season. Still 22 degrees with 14 degrees air temperature and cloudy weather, basically winter average conditions, should still be considered a success for a system designed to improve the middle season months swimming experience. We had a great trip to the Amalfi Coast and the villa was a fantastic place to stay. We had a party of 13 adults so two couples had to share a room and some rooms had single beds, but it was no problem for us. The pictures do not do the property justice!! The views are simply amazing and the pool is more than large enough for the group of 13! We made several trips to the grotto, it is more than worth the climb down and back up. You can enter the water through the grotto or be adventuresome and do some cliff jumping. I wished I had some snorkling gear or a life jacket as it is adjacent to the Maiori Grotto which is even larger, but a very long swim. We had a car service and used a local taxi to get into town. The driveway is long and fairly steep (but normal for the area), plan ahead on what you want to do. Overall this was a fantastic villa and would stay again for sure! We had a splendid stay at the villa. Ulrico was such a good host and replied so promptly to any questions asked. Even went the extra mile to clarify all queries and searching for scooter rental shops for us. Camela, the housekeeper, was so efficient and thorough with her duties. She was such a lovely lady; it was great to see her every other day through the week. The villa itself was perfect. It’s location was prime but also peaceful, and very accessible to reach neighbouring towns of Maiori and Cetera. Even the drive to Salerno was fairly quick. The lounge/living area had a welcoming feel to it and it was nice to have both an outdoor and indoor dining area too. The kitchen was well equipped and an array of condiments were available for use. There was also a grill (at the outdoor dining area) available for barbecuing. We especially loved the fact that there were fresh chillies and other herbs available in the garden, such a nice addition to the villa and to our cooking. The bedrooms and toilets were clean and comfortable to be in, all rooms had air conditioners too. The pool was on the other side of the villa and it was so nice to swim in salt water pumped up from the sea. The walk down to the sea was not difficult and it was very nice to have access to the open waters. We very much enjoyed our stay and cannot wait to be back again in this wonderful part of Italy! Thanks again to Ulrico and Camela! thanks so much for your lovely review, it feels exactly the same when I keep the Villa for my own holidays. We loved staying here with my extended family, seven people total. The place was large enough to spread out, swim and eat. The views are incredible! The photos on the site represent the property well. The kitchen was on the small side but very well laid out and had all the cooking equipment you would need. It is a short trip to Maiori to buy groceries but driving that skinny road with buses coming in the opposite direction required nerves of steel. Giving it 5 stars since we all loved the place. Awesome! We were a party of 10 adults and 2 children arriving the day before Easter and staying for one week. We were looking for an adventure and Villa la Calcara delivered. The views from every angle are spectacular, the rooms are comfortable and inviting, and even though we were a large group it seemed like we always had enough space. The owners, Ulrico Bracci and Simona Iucci, have beautifully outfitted Villa la Calcara with art, WiFi, a Bluetooth music system and there is cable TV. The Villa is conveniently located to all the sights on the Amalfi coast including amazing places to eat. We did our share of dining out but were more than happy to find that by picking up groceries locally we could use the fully equipped kitchen and outdoor grill to make several meals and take advantage the views. There are so many positive things that could be said about Villa la Calcara but maybe the best is that it is a great place to begin your personal adventure on the Amalfi coast. 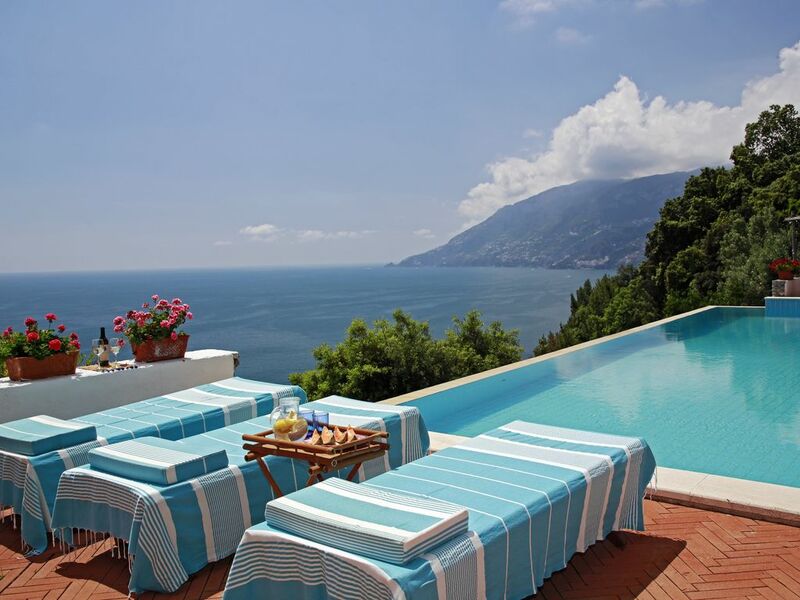 Villa la Calcara was and is a great place to call home while being on the Amalfi Coast! Swimming Pool: During the months of March, April, May, September , Octobe and November the pool is heated up to summer temperature. No chlorine, we have an Ozone system all natural water clean up. Car hire is highly recommended, many tourists prefer to hire cars with drivers. 65kms from naples (international airport capodichino). 265kms from rome (fiumicino airport). 3 minutes to Maiori, 5 minutes to Minori, 20 minutes from Amalfi, 25 minutes from Ravello, 40 minutes from Positano, 50 minutes from Pompei.